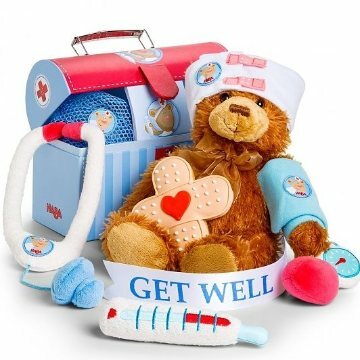 This soft, playful toy set with stethoscope, blood pressure gauge, plush teddy bear and more will be just what the doctor ordered. Whether for a child with a longterm illness, or any kid who just loves make believe, they will love the chance to play doctor with a soft, cuddly bear for a patient and fuzzy, durable tools of the trade. The power of play is well-documented in young children as a therapeutic and empowering way to deal with life's challenges. The award-winning parenting company HABA USA has been featured in The Daily Times newspaper, as well as Good Housekeeping and Parenting magazines for their high-quality child-centered products. This gift includes the following: -Doctor Bag: Inside the handled case is everything the budding physician needs to cure a pretend patient. Kit includes stethoscope, blood pressure cuff, thermometer, and bandage, all made from soft materials and stuffed with cotton. Also includes prescription pad and doctor mask. Guaranteed for hours of imaginative play. -Novelty Theme Cookie 1.6 oz: Natural, artisan-made cookie from honey vanilla sugar dough and hand decorated with royal icing. Fun shape and colors appeal to the young and the young at heart. -Plush Teddy Bear: A teddy bear provides the kind of comfort that can last a lifetime! Measures 8".